It took me 61 years to buy my first electric vest. Something about “new fangled contraptions” and “losing my macho” kept me from joining the 20th Century until we were into the 21st Century. Early in 2008, I bought an Aerostich Kanetsu Airvantage electric vest and wore it for several months, extending my fall comfort range right up until ice began to stick to the streets. In 2009, I discovered another warm electric product, the Kanetsu Electric Warmbib. At $67, even a cheapskate can justify mobile electric heat. 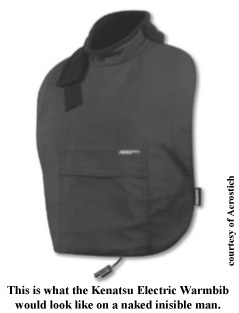 Like all things Aerostich, the construction quality of the Warmbib is exceptional. Mr. Goldfine wants me to say that my test product was “1st generation” and that the current version is improved. I haven’t seen the improvements, but my bib is terrific. My only complaint about the Airvantage is that it’s fairly bulky. I’m either committed to wearing it or it stays at home. I was too cheap to buy the sleeves for the Airvantage, so that’s a problem, too. The biggest reason I wanted to test this product was because I hoped it would fit under my Darien liner and that the self-packing feature would allow me to stuff the bib into my tank bag. Both assumptions were accurate. For example, on a moderately cool March weekend, I decided to make a run across town for some computer gear. I tossed my Darien over whatever I’d been wearing around the house and hit the road. About two miles from home, I realized 45 degrees F on the bike was a lot colder than 45 degrees F in the sun in my backyard. I stopped, pulled the Warmbib from my tankbag, strapped it on (without having to remove my jacket, helmet, or gloves), plugged in, and hit the road in near-instant comfort. With only the Warmbib and my liner-less Darien gear, I was polar bear toasty for the rest of the trip. The Warmbib is held in place only with a hook-and-loop patch that is the end of the stretch fleece collar. You just pull it around your neck and push the collar on to the hook patch and you’re set. The Warmbib uses the usual Aerostich wiring gear, including a lighted switch or not, and I simply plugged mine into the wiring I installed for the Airvantage. The slick Gore-tex® Windstopper® material on the front allows the bib to slip under your jacket while the fleece at the back of the bib does a fine job of holding the bib in place. Compared to typical heated vests, the Warmbib’s 2.5A, 30W consumption is 66-250% less demanding on your bike’s electrical system. That’s worth considering for dual purpose or scooter applications. In fact, I installed wiring for the Warmbib on my Kawasaki KL250; a bike that has a limited electrical system capacity. I was worried that I’d really miss the heat my Airvantage applies to my back, especially on below freezing days, but that hasn’t been much of a sacrifice. In use, the Warmbib might even be a diet device. I’m not kidding. The bib heats your chest and stomach, but the heat on my gut isn’t much different from the warm afterglow of a big meal. As a daily commuter accessory, the Warmbib does the job effectively. I include mine on any spring or fall ride that has the slightest chance of turning cold. Now that cold weather is upon us, it’s back in my luggage and I’m ready for winter.